More threats ..haven't we heard all this before ? Don't recall any threat(s) regarding this cave; read an article which seemed factual though. 1 Like Tony_B likes this. I assume this relates to the recent article on Dankness Darkness Below. I wonder what Wookey Hole do for insurance as they have a very similar situation. Show cave, with well preserved "wild cave" beyond. Accessible to cavers either through the show cave or by diving through the ungated resurgence. I know there has been at least one other entrance (now blocked?) and I believe there is also an access through the cliff face. Are there others? The site is very well known for it's scaremongering and propaganda. So, it's a rumor that someone has restarted a dig. Has anyone bothered to actually go and check this? Is someone actually digging again, or is it still abandoned? The more cynical minded people amongst us may wonder if the rumor was started by those having an interest in a highly controlled access in general. Has anyone bothered to actually go and check this? Is someone actually digging again, or is it still abandoned? If you go to check, you'll doubtless get accused of restarting the dig! Knowing the lot behind that site, aye, they like doing things to try to shut me up. Some nasty tricks have been pulled, and no doubt more will be forthcoming. Peak cavern works well with a locked entrance to the rest of the cave. but then I think that the lock is more to keep unsuspecting people from entering the cave, the main big gate stops people from getting in and out. The smaller door inside stops people from going further in. To me this system seems to work, I think there is a great fear of the unknown from this one. If the dig is so close to getting in, then a bad winter might see it happen, whether cavers are involved or not. I would say that obtaining the relevant permissions to dig a SSSI, conversing with the showcave owner to alleviate any misgivings and inform the wider caving community that money will be needed to secure both entrances. Derbyshire key on the top entrance and a lock on the bottom. The sooner you prepare, the less hassle it will be. Doing work for the showcave owner will only put you in the good books. It would be nice to see a copy of the insurance as the second showcave has two entrances and obviously doesn't invalidate the policy . Surely wardens can have a key based on trust. So reading that, we would loose access via the show cave but they won't be doing anything about the new entrance so access would not be lost, otherwise why do they need to allow access for cave rescue. This sounds like access will be allowed/out of their control for the new entrance. 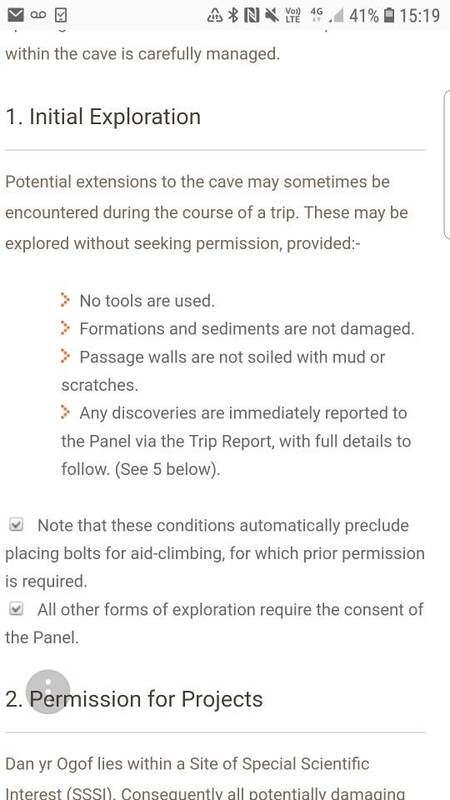 So this is good for access, depending on how the new entrance is handled cavers may no longer have to have green cards etc as it sounds like the showcave owners want nothing to do with the rest of the cave by the sounds of it. Good for access, good for exploration, potentially bad for conservation, but not a complete disaster if it happens and depends how people want to manage the new entrance. I imagine the walk in would be a bit further though, it will still be a single entrance, just somewhere else. Scrappycaver makes a good point about the fragility of the insurance argument for DYO, when it doesn't get invoked for Tunnel Cave, and is resoundingly backed up by alastairgott's reference to the Peak Cavern showcave which connects to Speedwell (another showcave), as well as the JH and Titan entrances. and why has it been deemed useful to expand a rumour ('At a recent meeting of the Dan yr Ogof Conservation Panel, Natural Resources Wales (NRW) revealed that a dig thought to be above the Mazeways area of the cave may have been restarted.') into another homage to the wisdom of access committees/ cave management groups / conservation advisory panels? In S Wales we now have four of these groups, none of which now report on their meetings, and few of which reveal the identity of any of their members. The PDCMG used to be quite democratic (albeit jerrymandered) but has ceased to publish details of its meetings or show any interest in maintaining its website; the MLCMAC has a more attractive website, but says virtually nothing about its composition or meetings - we just get to see who the secretary is because it is part of his website [http://mlcmac.org]; the OFDCMG [http://ofdcmc.org.uk/] has an attractive website, but only names its secretary; while the DYOCAP has an excellent website [http://www.dyo.org.uk], but reveals the identities of none of its officials, nor of when the meeting which started this thread took place. I suppose we must trust that these shady operations really do aim to help all cavers get into dark places rather than just keep them in the dark about what is really behind all this. But S Wales does seem to be like a black hole into which caving news disappears with only faint echos of any activity emerging. The DYOCAP were not aware of the showcave owners statement nor from my recent conversations were the NRW present. The gate was also installed 4 years ago drilling and bolting in a SSSI ,which in the dyo digging policy states no bolting ! I am being told the other entrance may be beyond sumps, if so then that is a total loss of access to most of the cave unless you are diver. Does anyone know one way or the other? No permission required but all trips must be warden-led? Kind of a contradiction if you ask me. Non of my business to comment, I don't cave in that region, but sounds like a bloody monopoly to me. If it enters Mazwways 3 then yes it's beyond a sump, two sumps in wets condition..
That being the case, there is far less chance of anyone getting into the show cave via this entrance than from the ungated resurgence! If the insurers are happy with the ungated, sumped entrance from the resurgence, they shouldn't be worried by another ungated sumped entrance elsewhere. It's covered on "dankness below" which can be googled. A hilarious read ! 1 Like Ethel.Bangrod likes this. The article in Darkness Below was initiated by the showcave management. One of the cavers who sits on the CAP was invited to review the original draft, and it seems as though his suggestions were largely ignored. He has since received something by way of apology. Nothing in the article is news to anyone who has been into DYO in the last couple of years; the metal grille that has been installed at the end of showcave has beside it a notice making it clear that if a second entrance is opened then cavers will lose access through the showcave. End of story. It matters not whether any potential second entrance is beyond sumps or wherever - the simple fact is that the showcave's insurers see a second entrance as an open back door and will withdraw cover. Will the second entrance provide 'better' access? Well if you do have to dive the Mazeways sumps to get into the rest of the cave then I doubt it, but in any case a dig shored with - as is common - bread crates could hardly be said to provide 'better access' than that currently available. The situation with Tunnel (Cathedral) Cave is different. There has always been a locked gate at the end of Cathedral Cave that prevents unauthorised access from the wild cave and in order to achieve a through-trip one needed a key to this and permission from the showcave. Although through-trips are still technically possible they rarely happen. Let's be clear about the situation with the unauthorised dig that has caused all this. It was an illegal dig on an SSSI, that was a PDO (Potentially Damaging Operation) for which no permission was sought or given. The person held responsible was the landowner - that's the law. She narrowly avoided prosecution. Just stop and consider that for a minute: a rural landowner prosecuted for the actions of cavers. Imagine the harm that might have caused, nationwide, to landowner relations and cave access. On the Facebook page on which the Darkness Below article was shared, some have questioned why this dig was a problem when digs on the Black Mountain, at the numerous DYO sinks, are not. Several reasons: first, as described above, this was an illegal operation on an SSSI. Second, the sinks are so far beyond the end of the known cave that it would need a breakthrough of unimaginable good fortune for any of the associated digs to get anywhere near the existing cave passage. It's not going to happen. And third, the SSSI dig was directly above the known cave, and was a declared intention to create a personal 'back door' to DYO by an aggrieved caver whose permit for the cave had been withdrawn. Much of the land above DYO and beyond is owned by Welsh Water and administered on their behalf by the Brecon Beacons NPA. They are amenable to digging activity if permission is sought; a group of us are currently working on a dig on the Black Mountain which was granted permission; we submitted a reasonable proposal and agreed to perfectly fair terms and conditions. 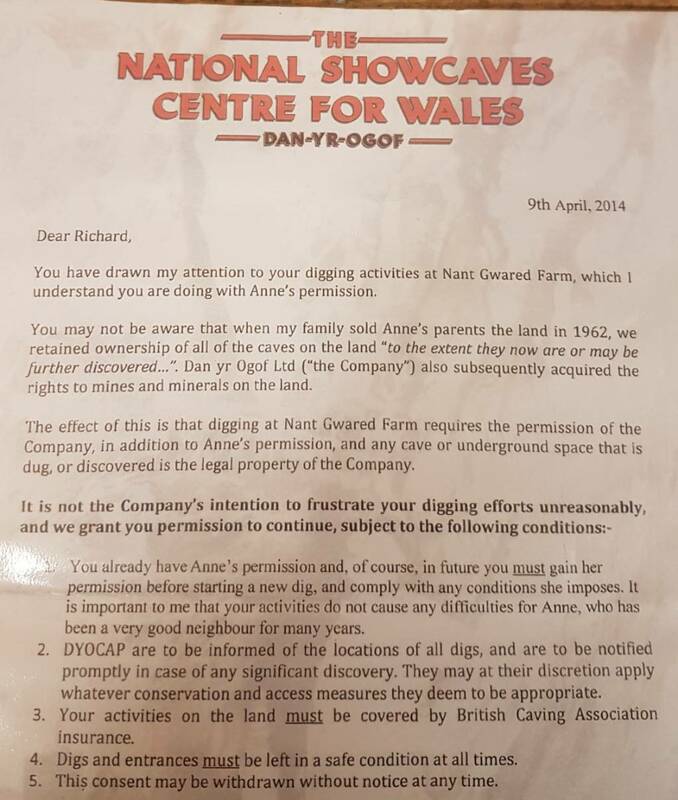 The actions of irresponsible diggers - 'freedom fighters' to some of you - jeopardise the long and harmonious relationship that has long existed between cavers/diggers and the BBNPA and NRW as well, of course, as the continued access to DYO granted by the showcave. The management of the showcave have always been supportive of the efforts of diggers, both inside and outside DYO. Sensible projects within the cave have been given permission, even some very close to the showcave itself. Those of us that dig on the mountain above DYO are allowed to use the car park, free of charge, a privilege which is not extended to walkers. In the past the showcave funded the purchase of timber for a dig on the mountain, and the owner has always been genuinely interested in, and supportive of, digging work that might find the missing miles that must exist between the known cave and the various sinks. What he won't put up with is sustained attempts to create personal access to the cave by an irresponsible minority. As the Darkness Below article makes clear, cavers have long enjoyed access to DYO, which is one of the finest and best-preserved cave systems in Europe. The Warden system exists for the peace of mind of the showcave owners and has long served to protect the cave. Access is readily available to anyone that wants it (with one or two notable exceptions) and by far the most restrictive aspect of entry to the cave is the Welsh weather. 4 Likes Jopo, Damo, oldcaver and HeathJ like this. Clearly you don't cave in this part of the world or you'd understand what this means. 'No permission required' means that you don't need to arrange trips in advance with the showcave (unlike some others). A Warden can arrange to take a party according to his/her and their availability and just turn up and wave their permit (or collect a key, if the showcave is closed.) Hope this clarifies the meaning. Care to share which parts of the draft were ignored by DB? Seems a bit of an accusation... Have DB corrected them? Finest and best preserved in Europe is a bit of a stretch given the place is full of fibreglass models and drilled holes for Christmas lights, but I guess you're obliged to say that...! I think you will find that DYO gave permission then called the police. 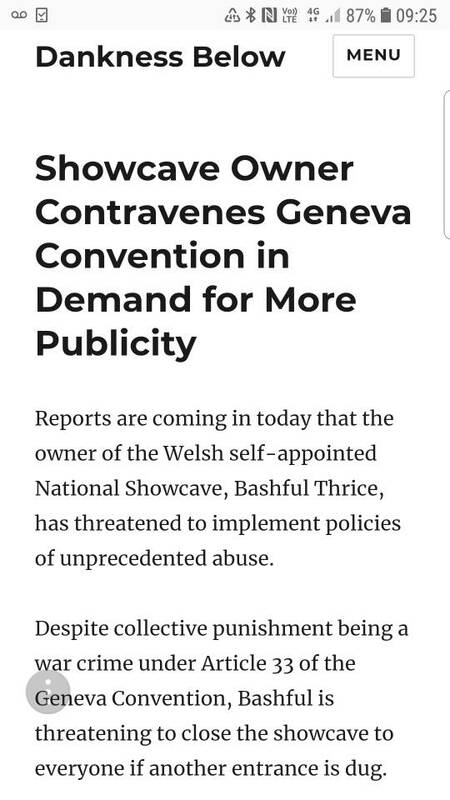 The NRW did not get involved and no charges or reccomendations were made to any party, In fact the showcave had some explaining to do by not disclosing the concent letter. All this is water under the bridge . The catchment in question was in grit so we cave elsewhere but because we cave above dyo we get accused of digging 2nd entrances. The limestone outcrops up there only sit 3-400 ft above known passages so like you say..to penetrate dyo is nearly impossible. It sounds like the accusatory tone DB and Tony are taking over any "illegal" dig neglects to mention that the owners and the DYOCAP would be complicit in such illegality, if that letter is anything to go by. I trust the owners and DYOCAP have learnt from this episode and now have the proper consents in place for all modifications to the cave?